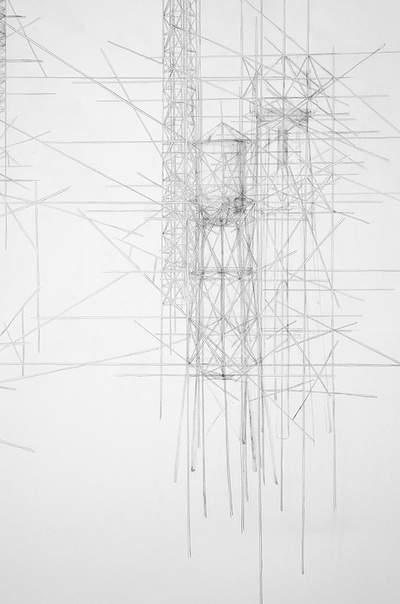 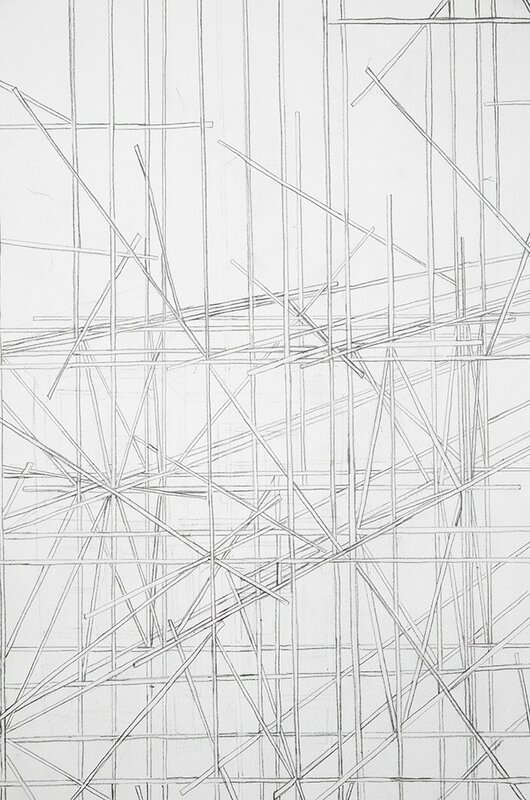 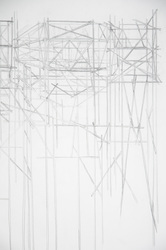 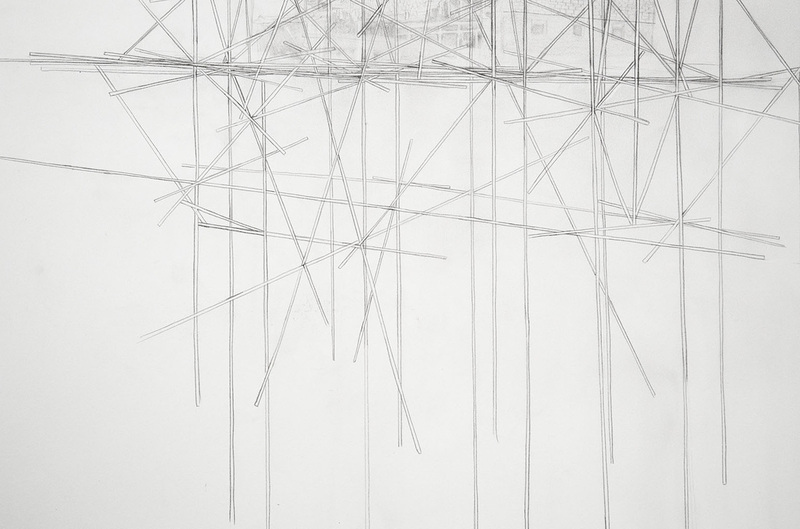 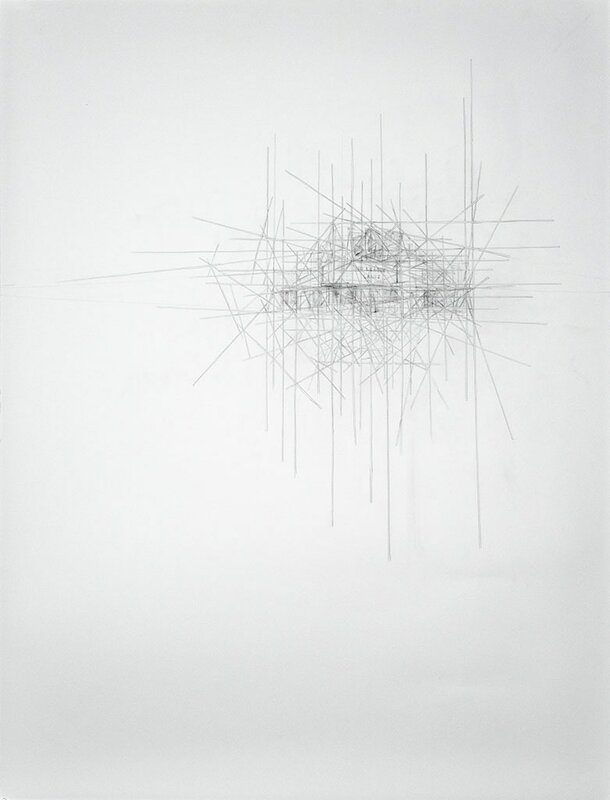 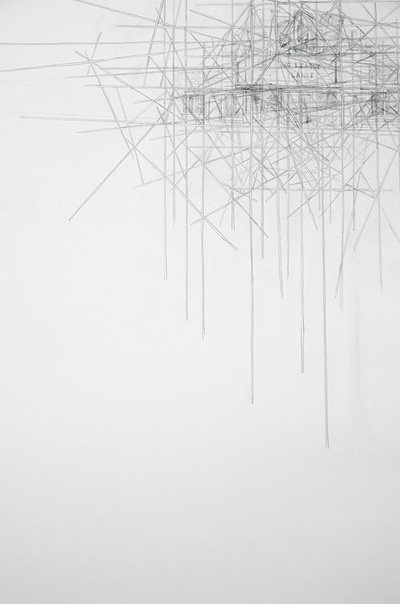 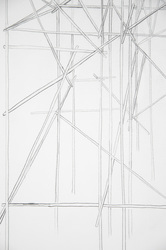 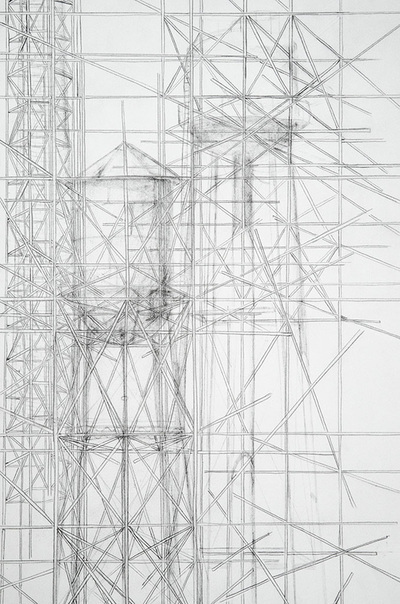 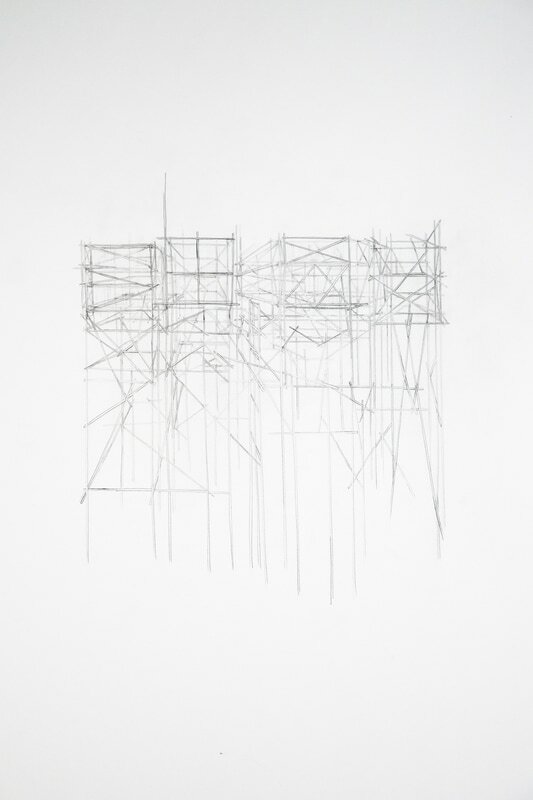 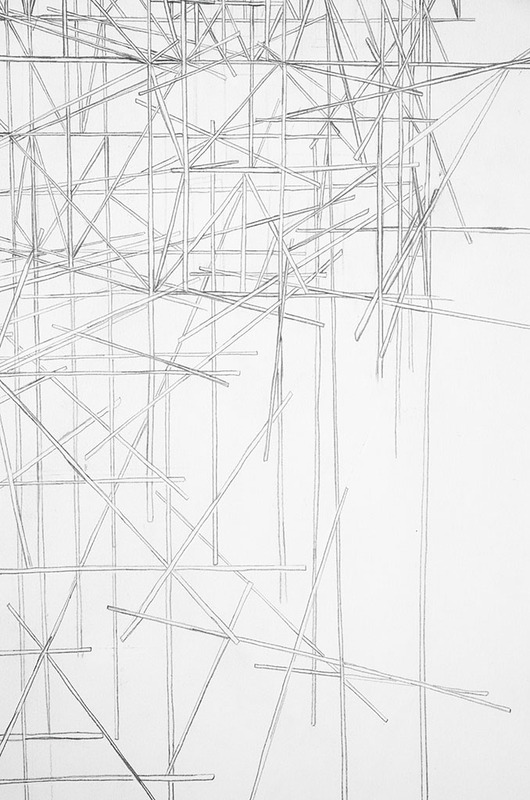 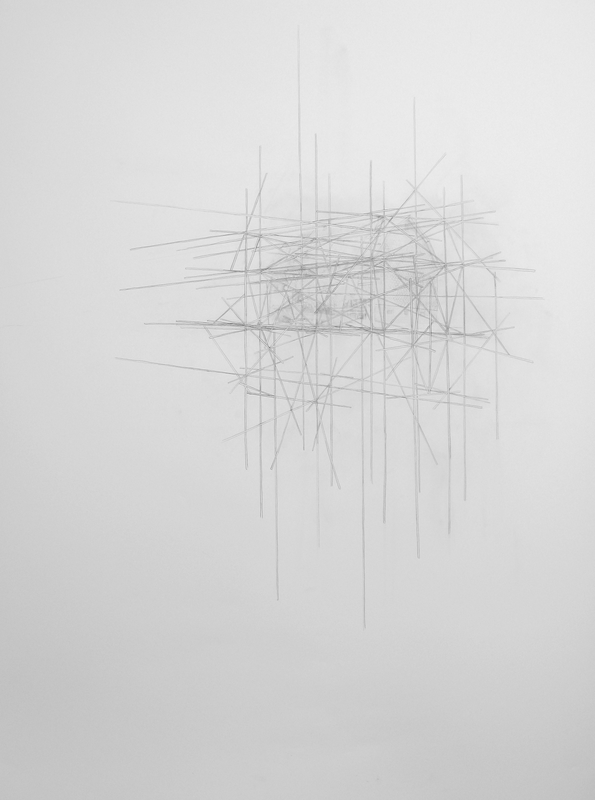 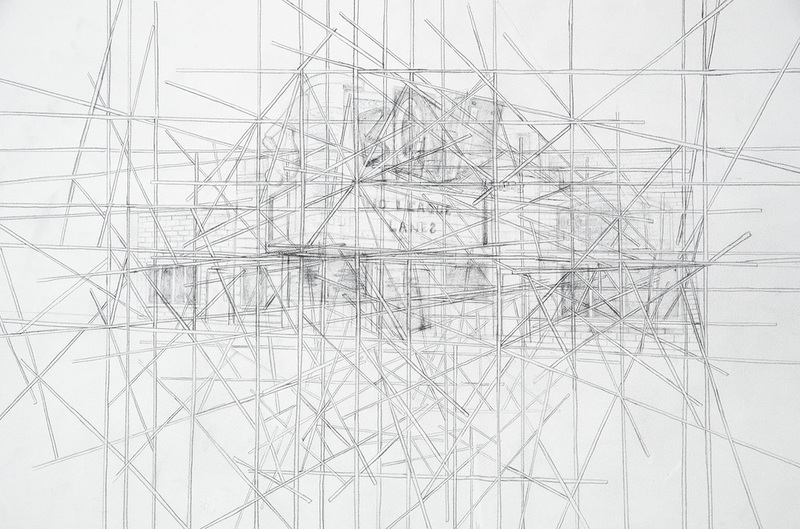 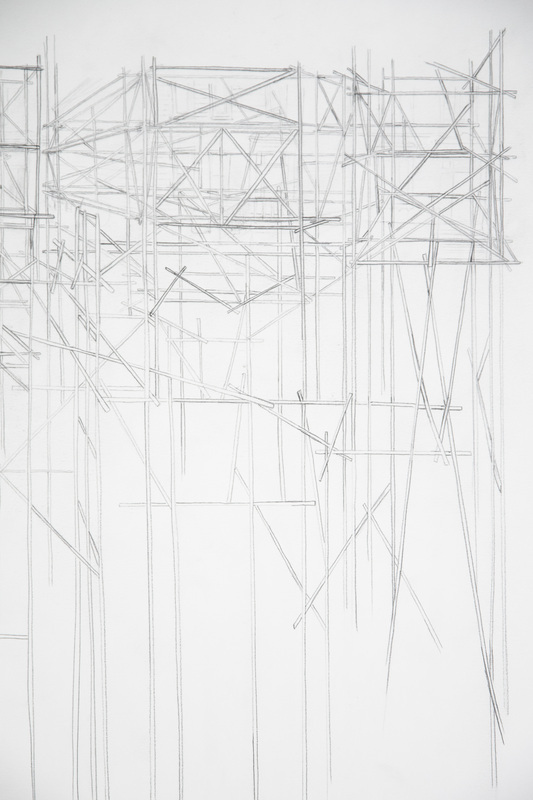 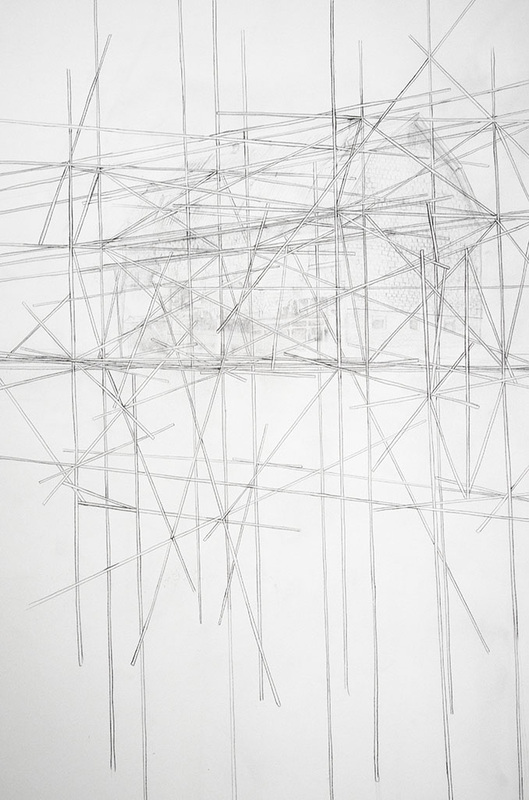 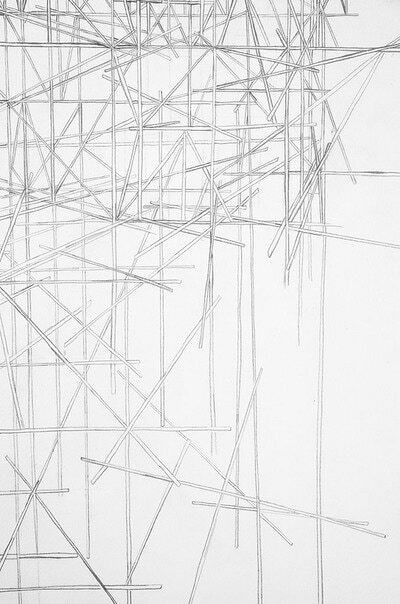 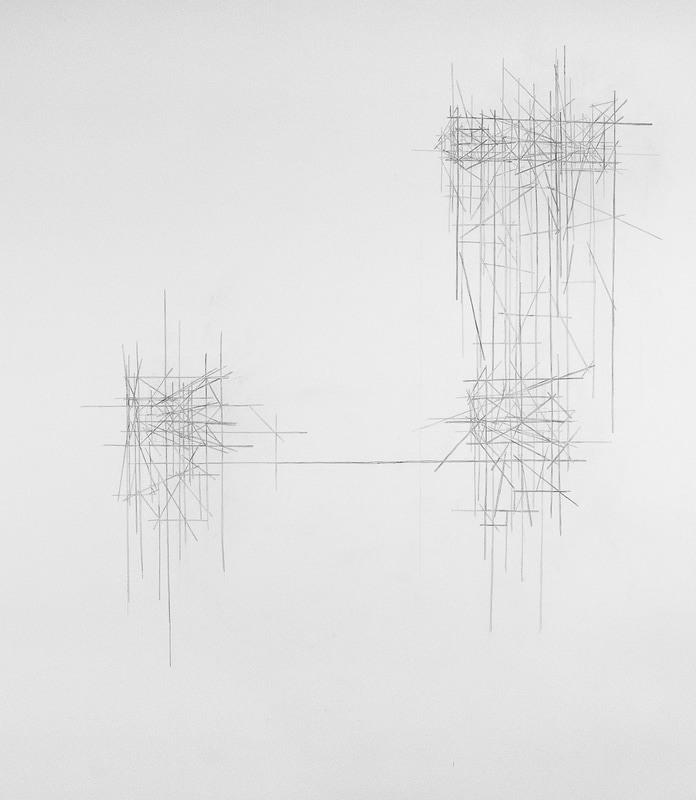 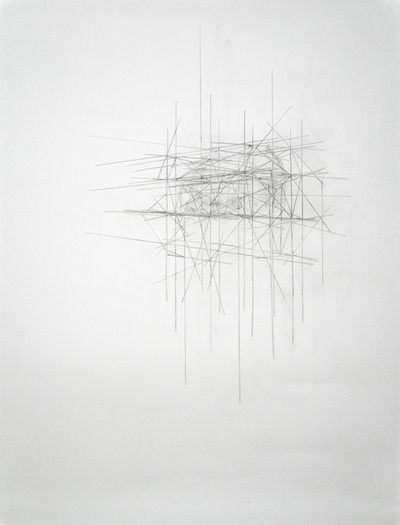 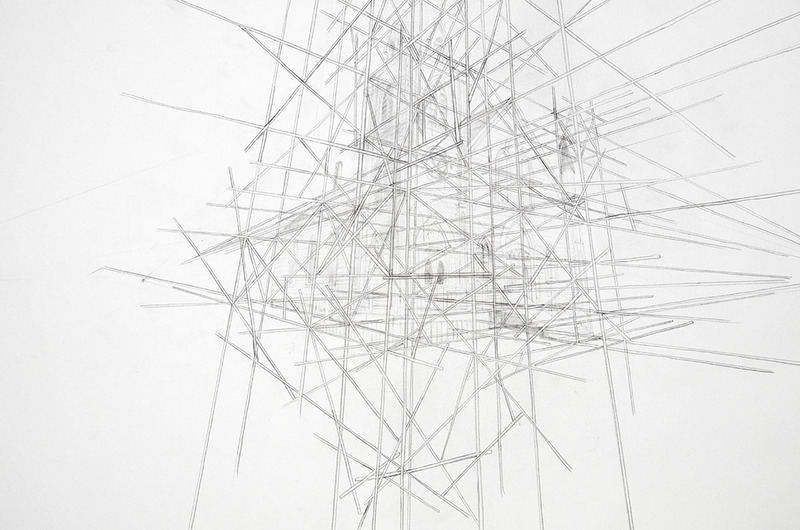 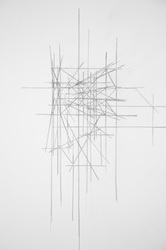 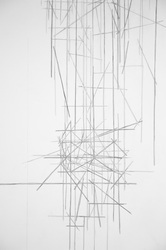 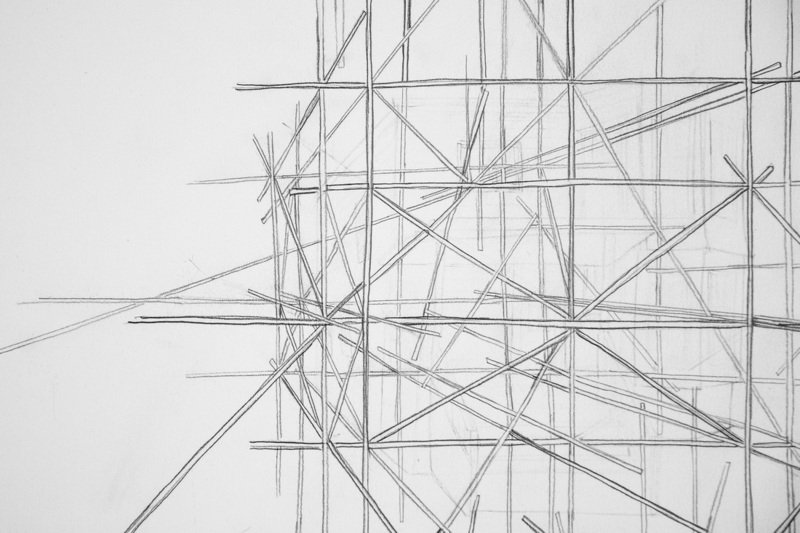 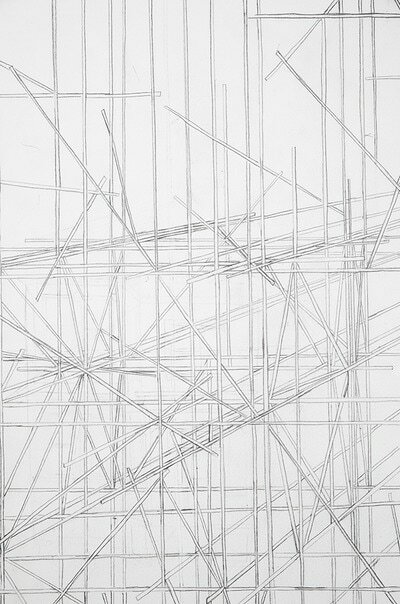 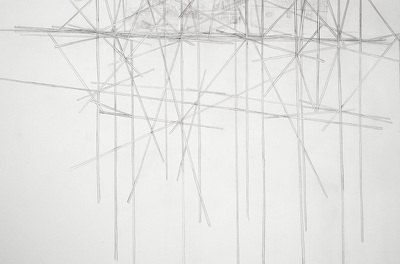 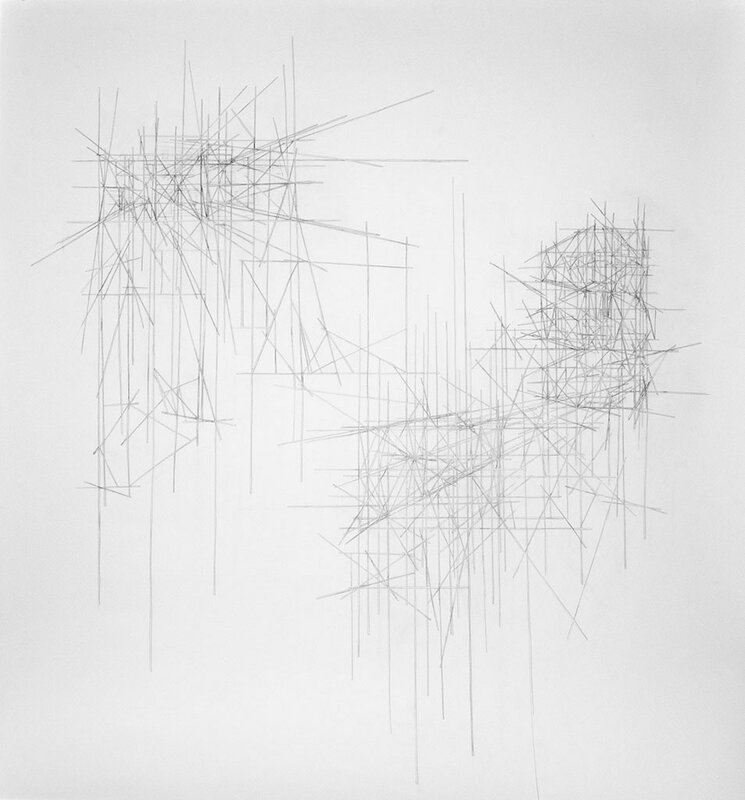 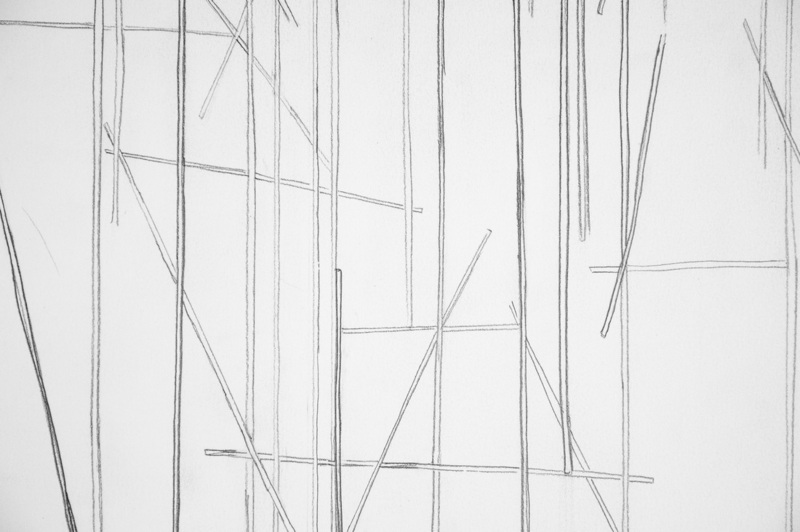 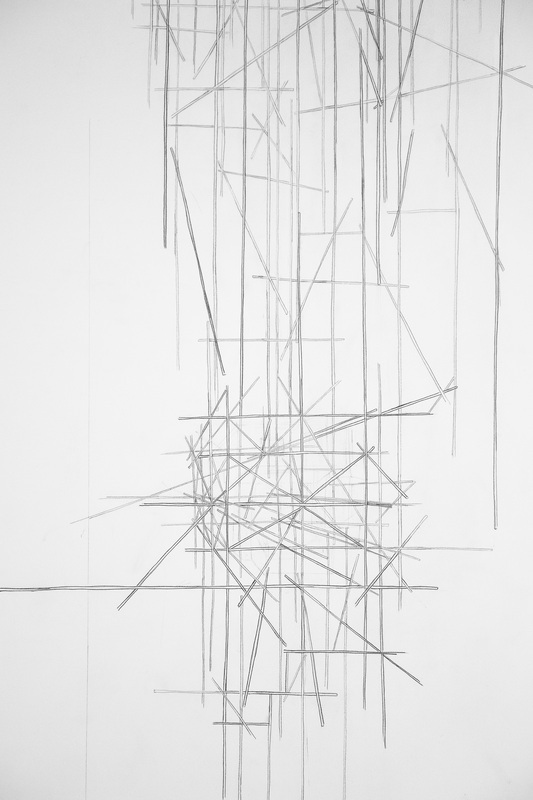 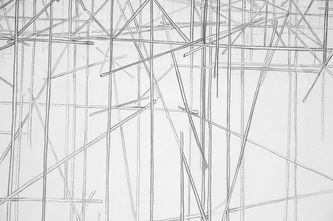 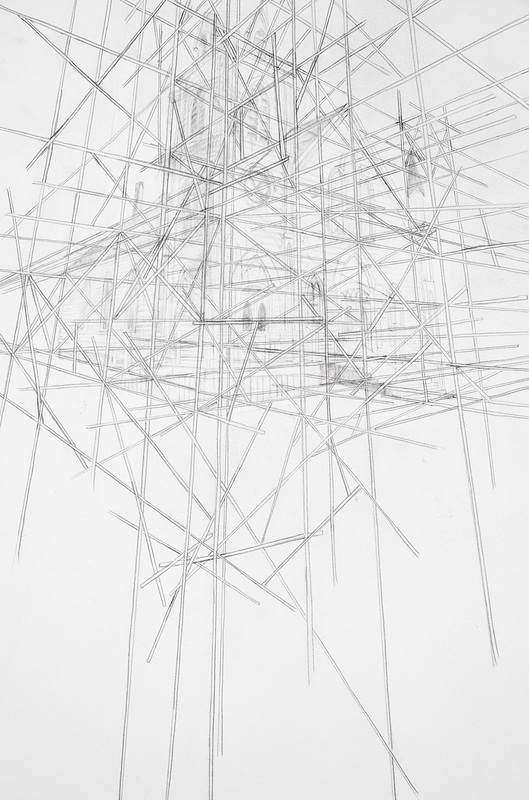 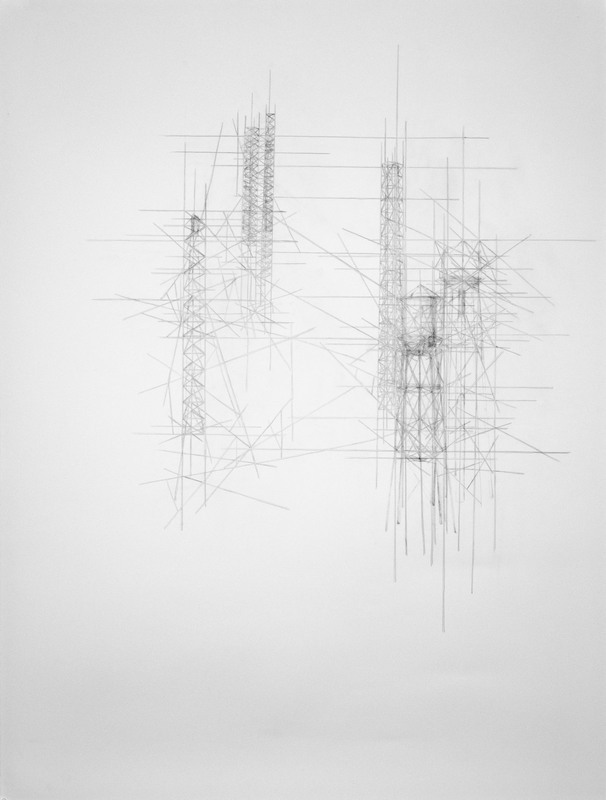 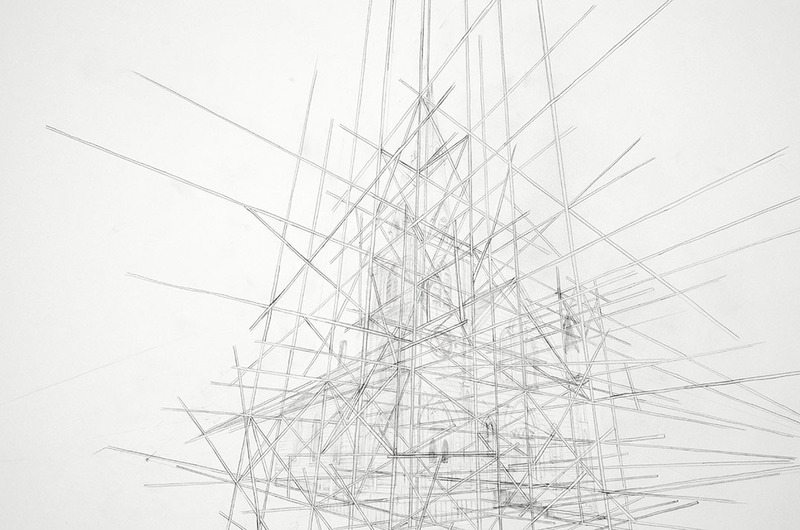 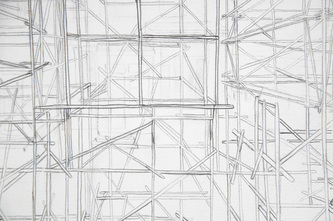 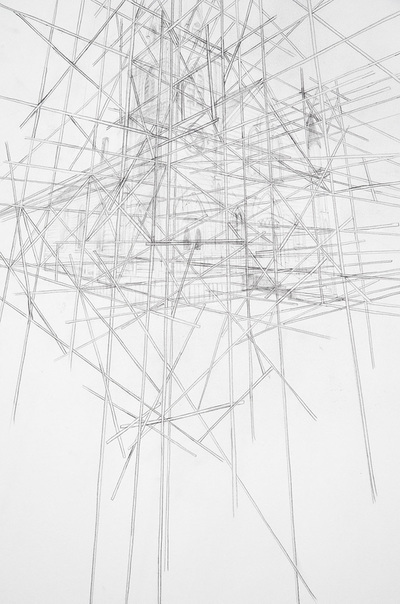 Structure is a suite of large graphite and erasure drawings of scaffolding drawn over top of buildings that once played major roles in fostering communities. Neighbourhoods, churches, bowling alleys, the family farm, and mining towns were spaces for public discourse and support. 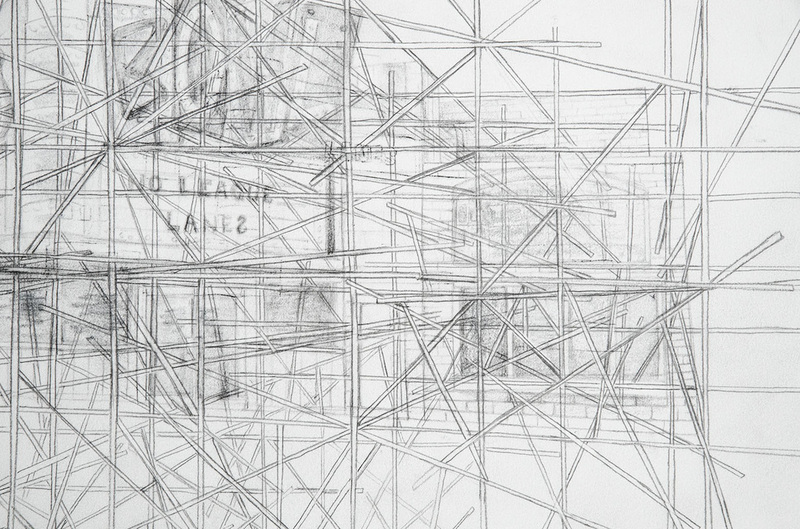 They provided environments that offered one a sense of belonging and place. 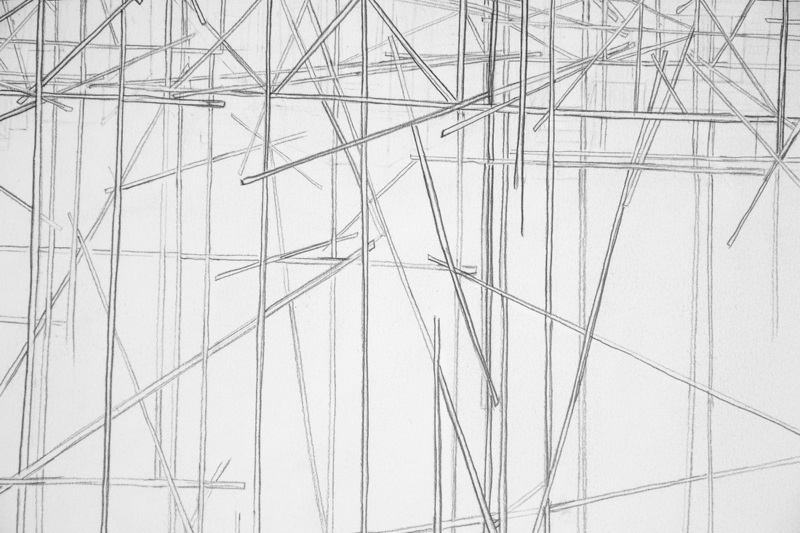 But as cities expand, economies dwindle and people become more nomadic these spaces that used to provide structure and order are disappearing. 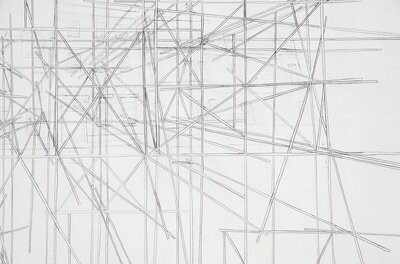 In Structure these spaces are drawn in detail and then erased to leave a trace of what once was. 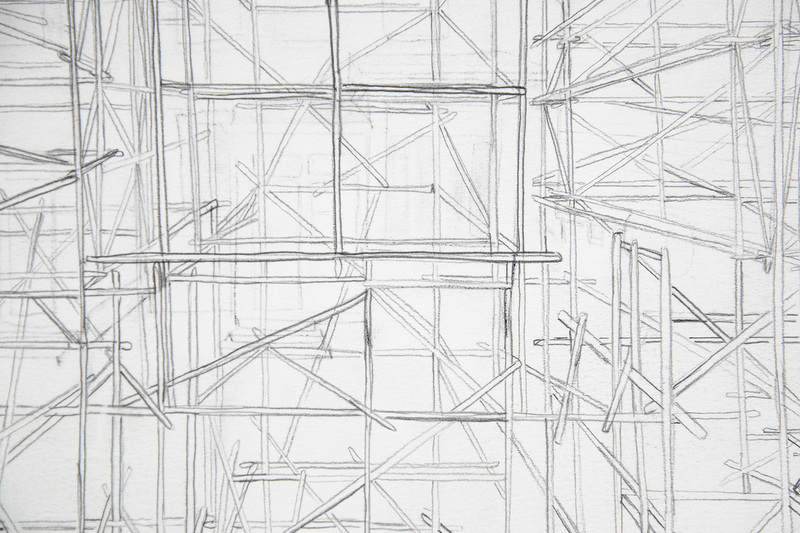 I then start to construct scaffolding over top and around the buildings. 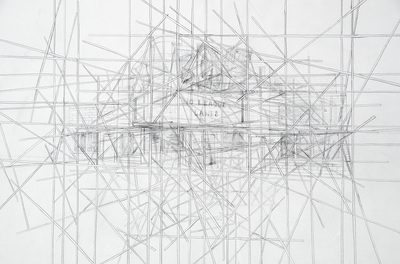 Each piece that is drawn is carefully placed as though it was being built in 3D. 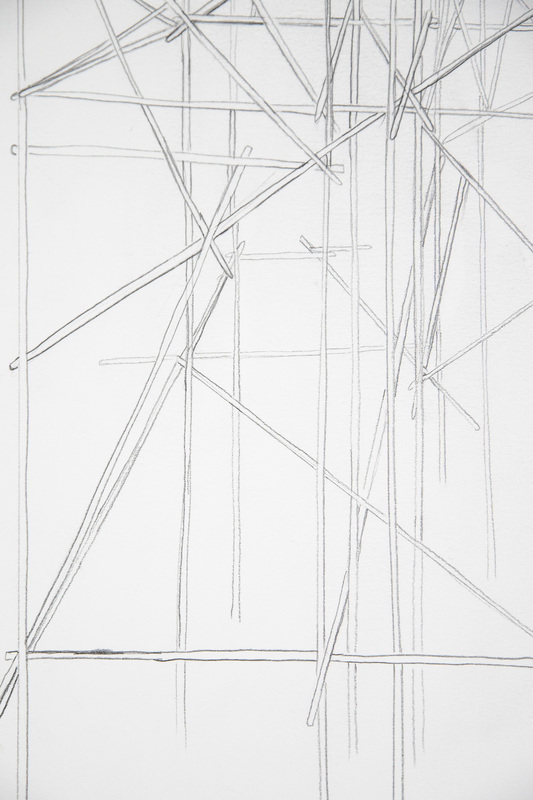 Every stick connects, supports or leans on another to either build or rebuild, create or recreate these spaces. 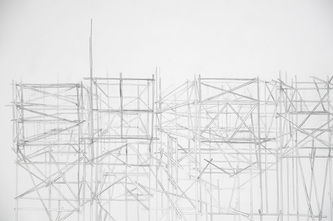 Scaffolding is a very utilitarian thing. It is a temporary object that notes construction, a work in progress or the formation of something. 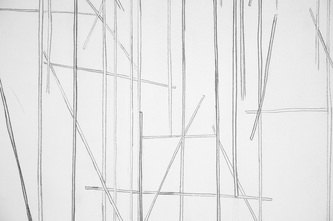 When used properly it is a safe means of reaching something that is inaccessible. 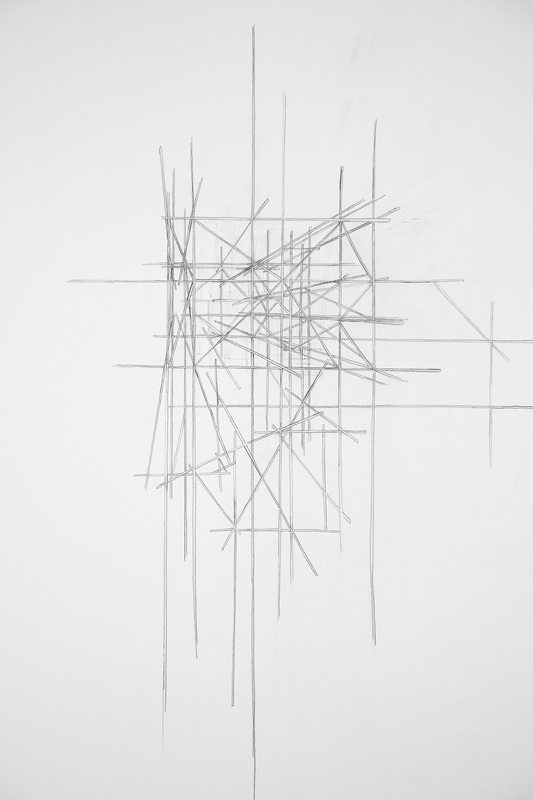 It suggests a lack of permanency. 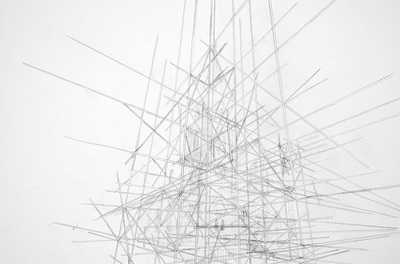 It enters the sky alongside a building, not joining or adding to its surroundings or aesthetics. 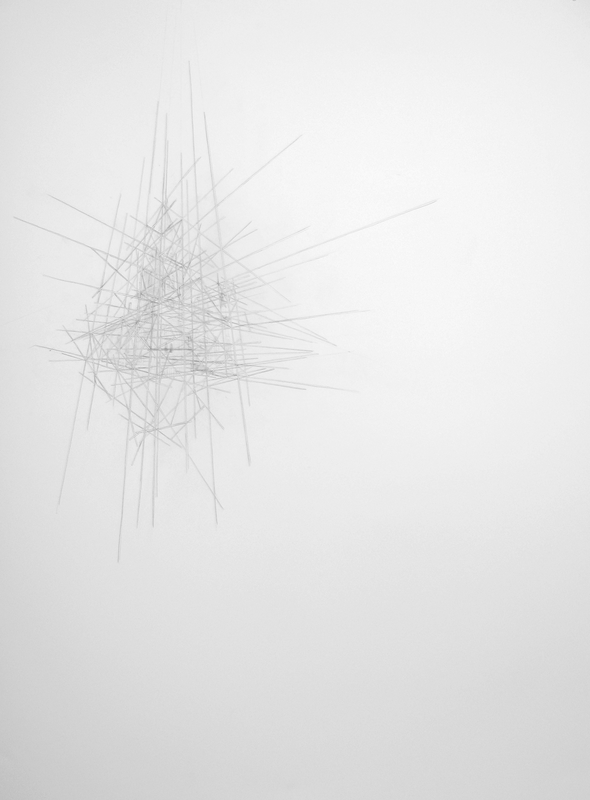 It is never erected for its own merits, as it is not considered inherently beautiful. 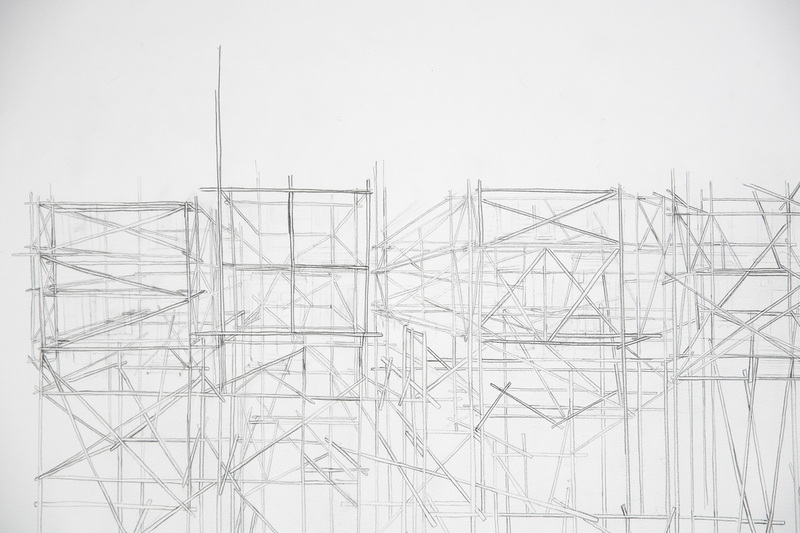 When scaffolding has outlived its welcome on the façade of a building, it is seen as not only inefficient but as an eyesore. 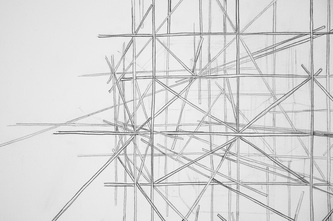 By removing the object from its initial function it loses its connection to capitalism and becomes unvalued as a utilitarian tool. 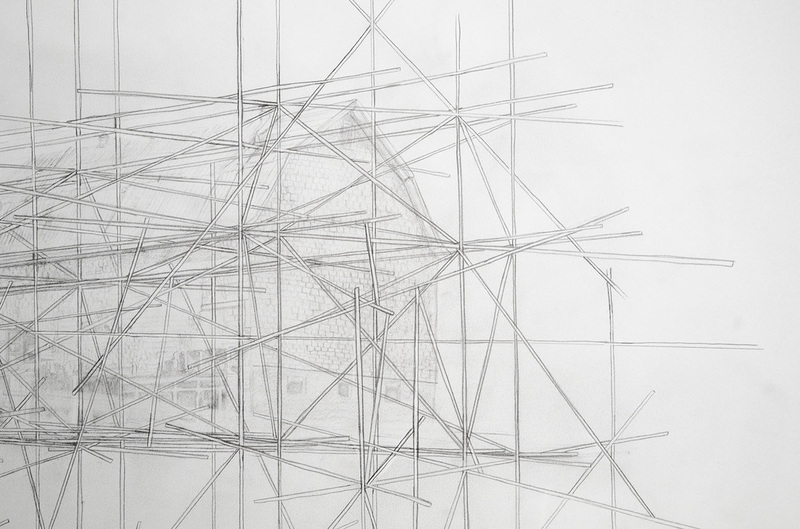 Through this body of work I am exploring the way in which we value or undervalue space, social structures and processes and in particular I am interested in using the concept of scaffolding to explore the intersections between construction and community.